South Korean actress, Gianna Jeon Ji Hyun (전지현) attended the press conference of Samsung Chef Collection as the brand's spokesperson on March 12, 2014. 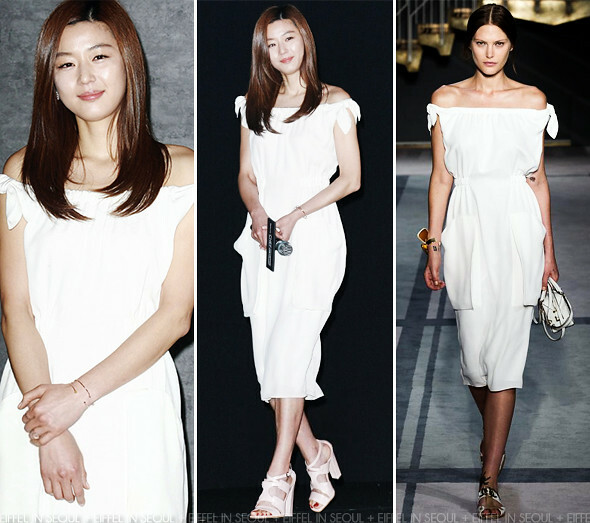 The 'My Love From The Stars' actress wore a white off-shoulder dress from Tod's Spring/Summer 2014 collection. Her look was completed with a pair of pink chunky sandals and Didier Dubot jewels.